Brandon and I got a good night’s sleep at Pat Haley’s home in Ashland, then took off the next morning to see Wilson Douglas in Clendenin, West Virginia. I wanted to hear more about his memories of Ed, play some music, and go see the old Laury Hicks homeplace. Wilson met us on his porch with Kim Johnson, a banjo player. We all went inside and got settled, where Kim mentioned that Laury first invited Ed to his house after meeting him in St. Albans, near Charleston. Wilson was quick to offer new details about Ed — of a more seedy variety. He said Ed “ran around” a lot with Bernard Postalwait when he was in the area. They usually got drunk and went “women crazy” and stayed gone all night. Hicks apparently had a “wild side,” too. Wilson hinted that he was a moonshiner who sometimes left home on timber jobs…and never showed up. We wasted little time in taking off to see some of Ed’s old stomping grounds in Clay and Calhoun Counties. There was a slight drizzle, just enough to wet everything. Our first stop was the Hicks homeplace, which had been overtaken by weeds on my previous visit in 1994. The weeds were gone this time, so we got out of the car and maneuvered through the rotting remains of an outhouse, chicken coop, cellar base, parts of an old fence, and scattered boards — all damp and colored dark brown due to the light rain dropping down around us. It was a far cry from the “old days” when (according to Ugee Postalwait) the family had farmed corn, wheat and cane all the way back up the mountain to the head of Hog Run Hollow. Gone were the apple and peach orchards. Gone were the gardens down by the creek (now taken in by the paved road). And, most obviously, gone was the old Hicks home, the last of four houses built on the site (the final one having been constructed in 1936). We soon made our way up the hill to the cemetery, where Brandon took pictures. I just kind of stared at Laury’s grave — picturing Ed playing there after Laury’s death in 1937. Later that day, Wilson showed us Clay, the seat of government for Clay County. This was the place where Ed Haley arrived by train from Charleston enroute to the home of Laury Hicks. Lawrence Haley once told me about his father walking from Clay to Arnoldsburg, a town some thirty miles away. Brandon had found this great article titled “Old-Time Fiddlers Will Gather At Clay Saturday” from a 1921 edition of the Lincoln Republican. Clay, W.Va., Jan. 10 — Elaborate preparations are being made in the little city of Clay for the old-time fiddlers’ contest which will be held on Saturday night, January 22. An attendance surpassing anything ever held in Clay is expected, and the hospitable citizens of this town have appointed a committee to look after the welfare of its guests. Similar contests have been held in various other sections of West Virginia this winter, but they cannot even compare to the one which will be held in Clay, it is predicted. Old-time fiddlers from far and near are coming to compete, and, if possible, carry off the honors of the evening. Among some of the celebrated old-time fiddlers who will be here is “Jack” McElwaine of Erbacon, in Webster county. “Jack” has played the fiddle for more than fifty years, and between times has been justice of the peace, preached the gospel and practiced law. He learned to play under Saul Carpenter, the most famous old-time fiddler of them all, and who played himself out of Camp Chase during the Civil war. 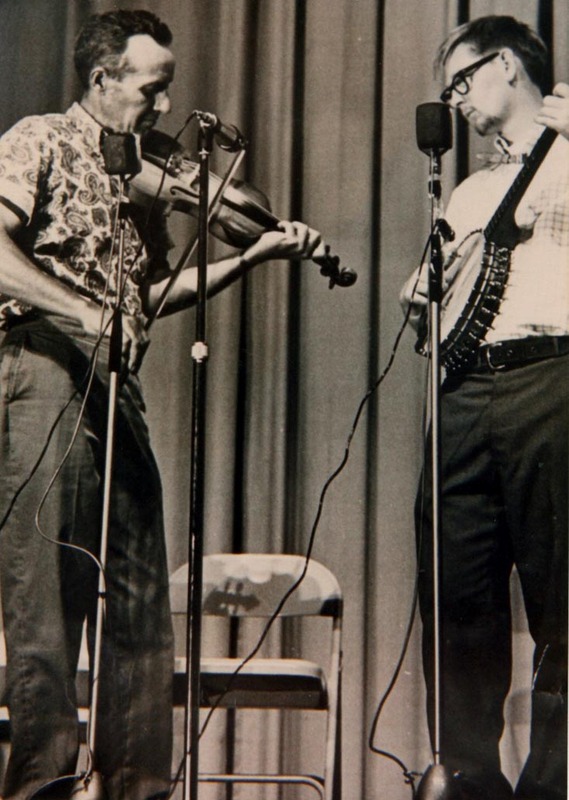 Another fiddler equally famous is “Edin” Hammons, who hails from the head of Wiliams river, and whose sole occupation all through life has been hunt, trap and play the fiddle. “Edin” has killed more bears, deer and played the fiddle more than any other man on Williams River. It is said that Senator William E. Chilton and Colonel Bob Carr of Charleston have been given invitations to attend the contest and compete with these old-time fiddlers. Several local celebrities are expected to enter the contest, and the old mountaineer fiddlers are looking forward to this part of the contest with great pleasure and saying “the city fellers will have to fiddle some to beat them.” No complete list of the fiddlers who enter the contest has been made public, but some fifteen or twenty are expected. Ben Friend, Ed Williams, Luther Carder and “Bill” Stutler, men who have been winning prizes in other contests, will be there. People of Clay and surrounding country are looking forward to this event with great anticipation and pleasure. The last contest of the kind was held at Richwood, Thursday night of last week, and fully 200 persons were unable to get into the theater where it was held. Clay, I found, was a small shell of a town with a nice old courthouse sitting high on the hill. There was the typical arrangement of buildings: sagging old businesses hinting at lost prosperity, a small bank, dollar stores, a car dealership, a post office, and a Gino’s restaurant. No red lights and basically one two-lane thoroughfare through town. There was a hotel with the weekly newspaper office headquartered beneath where, I was told, you could go in late and help yourself to a key and then pay for your room the next morning on your way out. After passing through town and crossing the Pisgah Bridge, we spotted an old section of residences and a community church. The track bed was still visible but the railroad was long gone. Wilson Douglas, fiddler, Clay County, WV, 1930s. Courtesy of Kim Johnson. French Carpenter, fiddler in Clay County, WV.